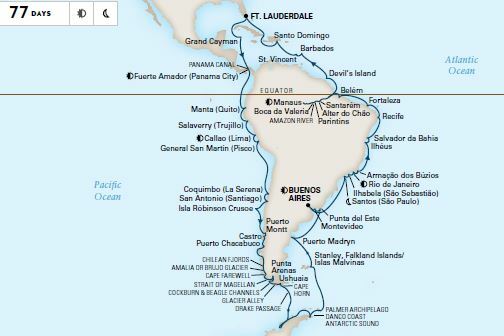 We're excited to announce that reservations are now open for the much-anticipated 2020 Grand South America & Antarctica Voyage! See it all — the Peruvian Andes, Brazil’s exotic Amazon, the ethereal ice world of Antarctica — as Volendam circumnavigates the continent. Take a samba lesson in Rio de Janeiro, trace the journeys of Charles Darwin through the wildlife-rich Beagle Channel and coolly spectacular Chilean Fjords, and relax on a pristine island beach in the Caribbean on your way home. Watch for exclusive amenities from Cruise & Travel Experts to be announced soon! Book by May 31, 2019 for Early Booking Amenities (available for full cruise guests - a value up to $4,000 per person) which are listed below in the Highlights section. •Spacious staterooms, most with ocean views or private verandahs with plush Mariner’s Dream® Euro-Top beds; generous storage space; pillow gifts on gala evenings; and a priest, minister and rabbi on board. Holland America Line ships are designed to be large enough to offer diverse amenities yet small enough to feel stylish and sophisticated. Because we sail with a high crew-toguest ratio, your clients will experience service that is truly warm and gracious, never in the way, yet never out of touch. In fact, guests often comment on our academy trained crew’s uncanny ability to remember their preferences. Elegant and spacious, 1,432 guest Volendam takes her decor cues from the garden. Her grand public spaces are graced with floral fabics and tapestries, as well as huge vases of fresh floral arrangements. While on board, explore the wonders of nature in BBC Earth Experiences. Enjoy a cooking show or hands-on workshop with America’s Test Kitchen. Relax with a spa treatment at the Greenhouse Salon & Spa. Or dine in one of our selection of fine restaurants.